Its probably the most flattering suit we make. The contour seaming makes it all happen. The double zipper is good fun. 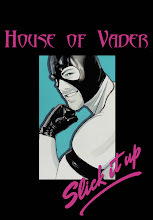 Pick it up at now at a discount using coupon code 'houseofvader" at Slick It Up.